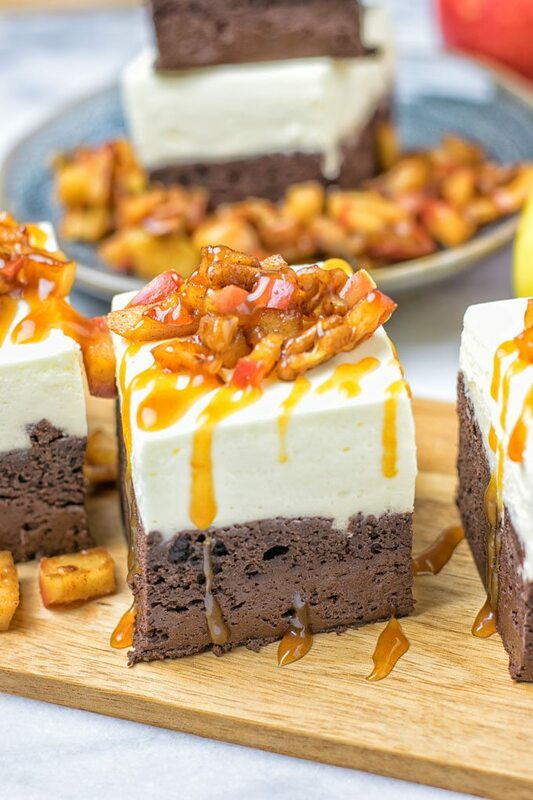 Tasty Cheesecake Brownies with Caramel Apples. 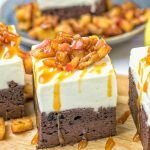 Vegan, quick & easy to make, these gluten free brownies come out moist and sweet without added refined sugar. Absolutely delicious and perfect for a dessert full of fall flavors. Bring every Thanksgiving dinner to end on a high. Folks, you know I post savory dishes more often than sweet ones. But I’m extremely pound about the ones I made. For example my Vegan Caramel Nutella Pancakes not only look stunning, they are an indulgence that I couldn’t say no to even for breakfast. When it comes to vegan cream cheese recipes, my Chunky Monkey Banana Cream Pie is as good as it gets. While we are getting towards holiday season at full speed, I thought about new ways to indulge my sweet tooth. Of course I want to get typical fall flavors into my newest creation. I don’t know about you guys, but I associate fall with the aromas of caramelized apples. So comforting when fresh and warm. Yum! So having caramel apples was one of the cornerstones of this recipe. Another thing that I always wanted to try out is making a cheesecake topped brownie. Just because I love brownies and cheesecake so it’s enough reason for me. 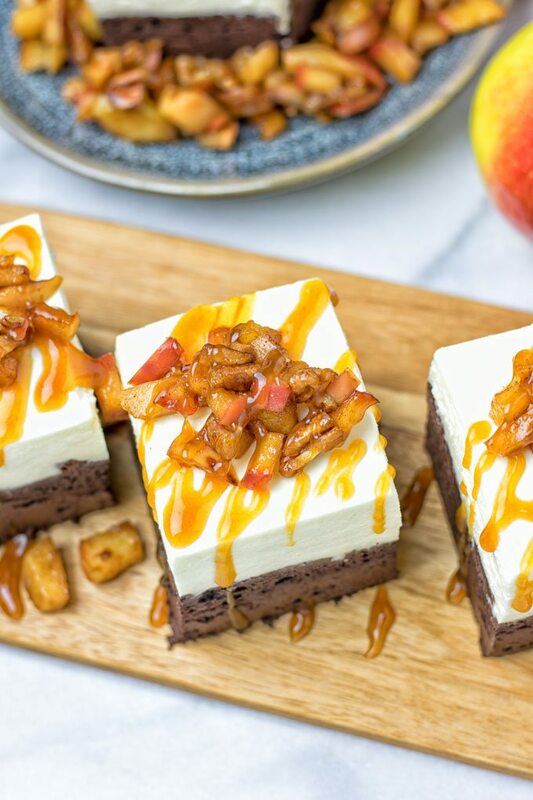 Now it’s time to let the magic happen with these Cheesecake Brownies with Caramel Apples. They are insanely mouthwatering, super delicious, festive, but not only made for the upcoming holidays, irresistible, made from scratch from everyday ingredients, impressive and a must make for everyone. Let’s face it the upcoming holidays are not far and the year is almost over, soon we will get excited what’s the new year is bringing next for all of us. The holidays are just a lovely season. You can feel and see the winter glow, enjoy cozy winter mornings with some chai tea. Oh yes, you can take all those mornings to a new level when eating these brownies, so let’s make them. The first thing on our list is to make the cheesecake topped brownies. All you need is a baking dish (approx. 10 x 7 inches) and one big bowl. Check the list of ingredients in my recipe for the Vegan Buckeye Brownies. They contain gluten free flour, natural sweeteners, raw cacao, and plant-based milk. Making the dough is as easy as it can get. One single bowl, mix the ingredients, and transfer the dough to the baking dish. After baking it need some time to cool down completely because we need to add the cheesecake topping on it. And that won’t work well if the brownies is still hot to warm. Of course I know it is hard to resist nibbling (or more) on the done brownie. Be strong, friends. For now we have to head to the next step. The trick behind this is not only how to make a vegan cheesecake. We are also going to make it without another round of baking. Otherwise, we have to put the brownies back into the oven and get bricks instead of soft and fudgy cakes. Or we could have tried baking brownies and cheesecake in one go. Yet both parts need different baking times it’s a mess to get right to the point. 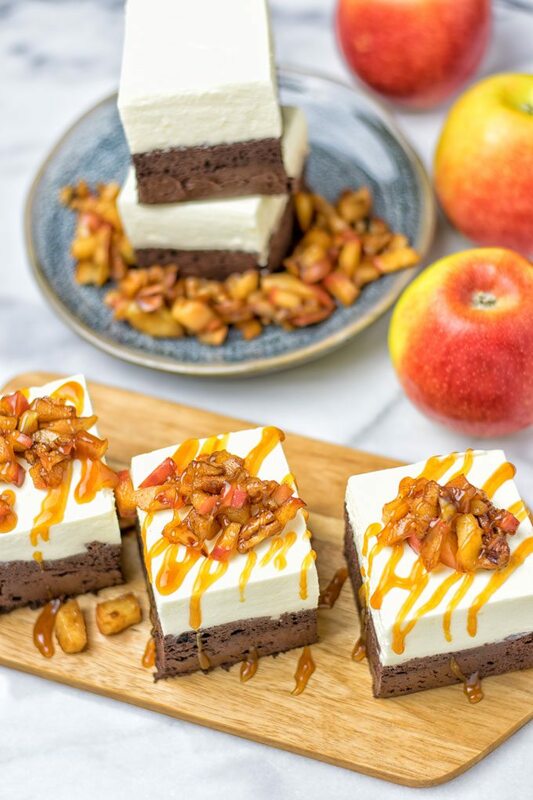 None of this is required for these Cheesecake Brownies with Caramel Apples. Simply hop over to my Lemon Banana Cream Pie recipe. Make a batch of the filling but leave out the bananas. They are not needed here, obviously, since we don’t want to mess with the apple flavor of the topping. When the filling is done, just give it over the baked brownies and put this into the fridge for some time. I recommend you keep it in there chilling overnight so that the no bake cheesecake filling really sets and hardens. For the topping, I chose to go with a slight adaptation of my Baked Apples Quick and Easy post from early times. Instead of using the halves of apples, here we dice the apples. With a mix of natural coconut blossom sugar and cinnamon, it’s easy to get the fall flavors right. To make the flavors stand out even more, we can add drizzles of caramel sauce. All it takes to make this is some dates, coconut nectar, and optional vanilla flavor. Check my Banoffee Cookie Dough No Bake Dessert for details. 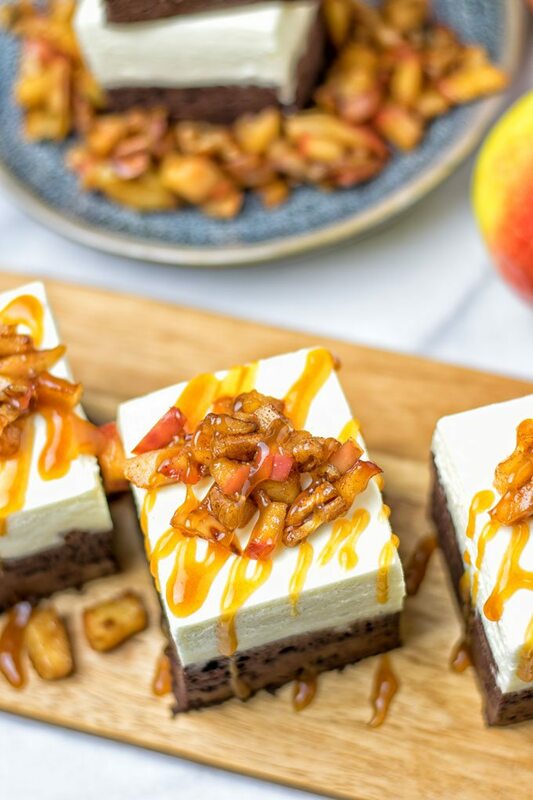 The combination of Cheesecake Brownies with Caramel Apples always wins over everyone. 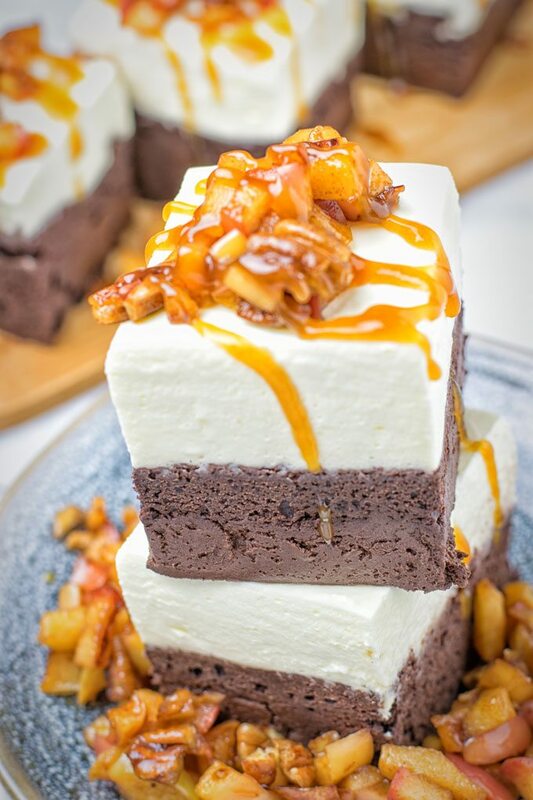 Who does not love brownies, especially when they are infused with those incredible flavors. Seriously, anyone? 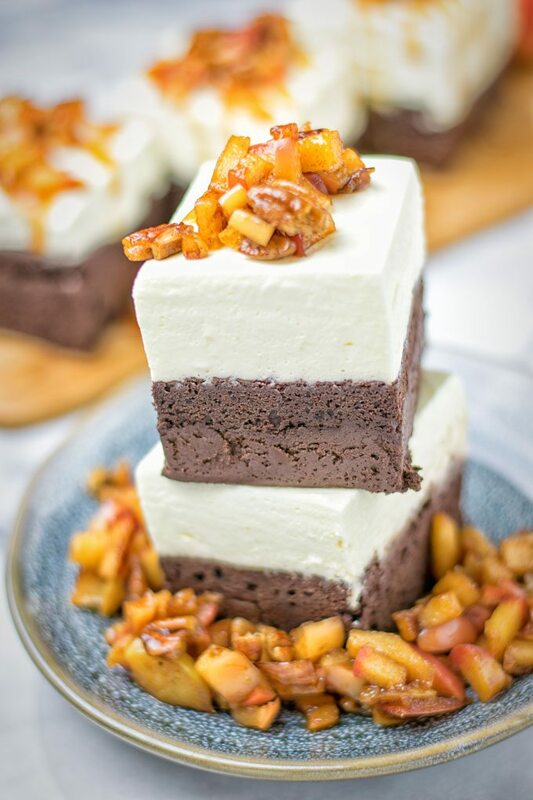 When you bring these brownies to a party, or serve them to family and friends, no one will guess they are vegan and gluten free. You can serve them your pickiest eaters and bring everyone faces to smile. Which such approachable ingredients the whole year, this not only something for the holiday season. Plus homemade caramel is always a winner and so good for many things not only cakes or brownies. I eat that often with some apple slices so easy and a great snack. A final note: if you need inspiration about what vegan cream cheese is and where to buy it, I recommend you read “5 Vegan Alternatives for Cream Cheese Lovers“. It’s a perfect recipe for sharing. If you don’t want to share a bite of it with anyone, then at least spread the word on Instagram and Facebook. Take a picture and let me know what you think. First prepare the dough for the brownies according the directions. While the brownies are in the oven, prepare the filling according the directions but leave out the bananas from the original recipe. After baking, make sure the dough cools off. Then you can put the filling on top of it. Dice the apples and prepare the baked apples according the directions. Last is assembling: divide the baked apple on top the cream filling, drizzle with caramel sauce as much as you like and enjoy.